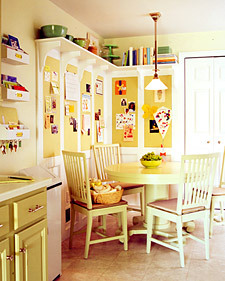 Efficiency and organization define this kitchen area. High shelving, wall panels that double as bulletin boards, and bins for sorting mail all help to open up the space and keep it from feeling cramped. 1. A shelf positioned just a foot and a half below the ceiling allows for extra storage and an opportunity to display cake stands and pretty bowls. 2. Cookbooks that aren't used every day are kept on the high shelf, away from much-needed counter and cabinet space but still within easy view. 3. Linen-covered boards are an attractive alternative to the refrigerator door for posting children's art, family photographs, schedules, and important reminders. 4. The ever-changing display keeps the area fresh and colorful, and makes redecorating an ongoing process. 5. Each family member is assigned a clearly labeled bin to keep track of mail and other incoming paperwork. Cup hooks, attached to the bottom of the lowest bin, hold keys.